Passover is a time for beloved traditions – especially family recipes that have been passed down from generation to generation. But your grandma probably didn’t have half a dozen different kinds of paprika at her disposal. It’s possible she never heard of quinoa, either. Well, times have changed. Palates have evolved. So when it comes to Passover, there’s no reason to feel stuck in a rut. Kosher food writer, personal chef, and media personality Naomi Nachman, a.k.a. the “Aussie Gourmet,” wants to inspire you to change up your Passover game this year by sharing some recipes from her best-selling cookbook, Perfect for Pesach. Pereg’s vast lineup of Kosher for Passover quality spices, spice blends, gluten-free flours and ancient grains is like an artist’s palette for home cooks; the possibilities are endless. Nachman shared a few recipes from her popular cookbook to spotlight some of these ingredients and show how easy it is to take Passover to the next level. 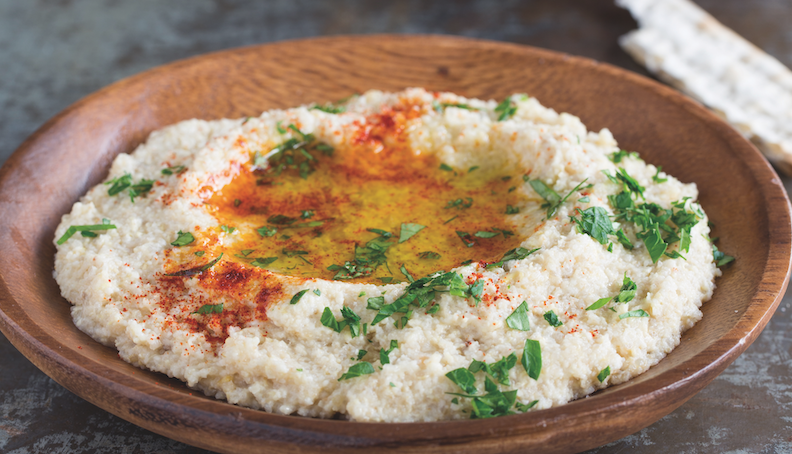 This relative newcomer from South America takes center stage in Nachman’s Quinoa “Hummus” recipe. Since quinoa is a seed it’s perfectly acceptable for Passover use. Quinoa is a versatile “superfood” in every sense of the word: packed with nutrients and protein, high in fiber, low in fat, and gluten-free. 1. Place quinoa and pine nuts into the bowl of a food processor fitted with the “S” blade. Process until blended. 2. Add remaining ingredients; continue to blend. Scrape down sides and blend again for approximately 30 seconds. Do not over-blend or the mixture will become gummy. 3. Transfer to a serving bowl. Garnish with olive oil, parsley, zahtar and paprika. Store in an airtight container. A staple of Mediterranean and Middle Eastern cuisine for centuries, this collection of herbs and spices is all the rage in the culinary world. It’s a zesty dry rub for meats and fish; it also brings earthiness to stews and soups and adds a high note to marinades and dips. Many high-end restaurants keep it on the table right next to the salt and pepper. Try Pereg’s Kosher for Passover version of Zahtar in Perfect for Pesach’s Seder Brisket or Matzah Ball recipes to kick things up a notch. (No seeds/notkitniyot). Pereg was established in 1906, and is based in Clifton, NJ. They first became known for their vast variety of pure and natural spices and spice blends, more than 60 in all, from traditional favorites to exotics from around the culinary world. Today Pereg produces an array of all-natural products that includes ancient grains and ancient grain blends, gluten free pasta, couscous, rice, gluten-free cereal and much more. Pereg Natural Foods products are available at select retailers throughout the US and Canada, and on their website, www.pereg-gourmet.com. Thanks for the delicious recipe. But it’s not clear to me if the quinoa is already cooked before adding to the recipe. It’s pretty crunchy, otherwise!